Bird feeders are rarely to blame for attracting rats into an area. Rats are more likely to be attracted by the odors from pet waste, outdoor pet food bowls, inadequate waste and garbage containers, compost bins, BBQ grills, vegetable garden waste or unharvested fruits and nuts from trees. To eliminate rats, deny them access to shelter. It is important to remove potential hiding and nesting sites from around your home, such as firewood stacks, brush and debris piles, dense shrubbery, ground covers and ivy. Repair and/or seal openings in buildings using durable materials, such as concrete, metal flashing, steel wool or heavy welded wire. In dry climates, rats are attracted to sources of water. Remove or repair all sources of free water around your home and yard. These include leaking faucets and irrigation lines, water bowls for pets and all sources of standing water. Good sanitation practices will effectively control the ability of rats to survive. Eliminating access to garbage, pet waste, spilled bird seed, open compost bins and un- harvested fruits and vegetables is crucial to rodent control.Rats are especially attracted by the odor from BBQ grills and they will eat the residue meat scraps and fats found on them. If possible, store your grill in a secure out building between uses and keep it clean of all grease and food debris. • No ground feeding. Bird food scattered directly on the ground can be attractive to rodents. • Select the proper food. 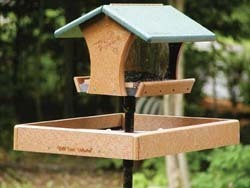 Consider feeding only a single type of seed in a feeder to reduce the amount of scattered seed that reaches the ground. Sunflower chips work very well as a tidy-feeding option. Quality suet or shelled peanuts properly placed and hung from a baffled pole will also work. If the feeders are not hung on a baffled pole, take them indoors each evening. Use trays under feeders to keep debris from falling to the ground. You can also feed black oil sunflower seeds or blends that are high in black oil sunflower seeds or chips if your feeders are hung on a baffled pole and have a quality tray placed below them. For ground feeding birds, use a small amount of a blend containing millet in a tray or platform feeder. • Don’t overfeed. Offer only as much food as the birds will eat each day, especially millet. Make sure the birds clean their plate everyday. • Store seed properly. Store seed in a metal, rodent-proof container in an area where rodents cannot reach. • Keep feeding areas tidy. 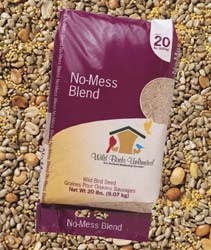 Sweep, rake or clean up spilled seed and seed husks at least once a week. 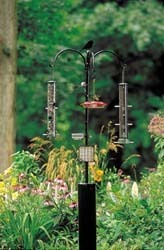 If possible, place your feeders over a hard surface so your clean-up will be faster and easier. Better yet, feed ONLY shell-less seeds like No Mess LM! • Use the proper feeders and trays. It’s important to select the proper feeder to attract the birds you want. Proper trays and screens placed below feeders will eliminate ground spillage. • Use baffles to eliminate easy access. Using a hanging baffle above any feeder protects against roof rats and squirrels. A pole equipped with a raccoon/squirrel baffle and set up properly (5 feet high) will stop rats from gaining access to feeders. • Install your APS setup in the proper location. In order to make your APS setup unreachable for rats, you’ll need to install it at least 10 feet away from any other object, including trees, houses, etc. This distance keeps rats from jumping on top of the feeders from trees, houses or anything else in your yard. free sanctuary in your backyard. • APS: Establish multiple setups with raccoon/squirrel baffles that are easy to relocate and reconfigure. Deck hardware also keeps debris off deck. 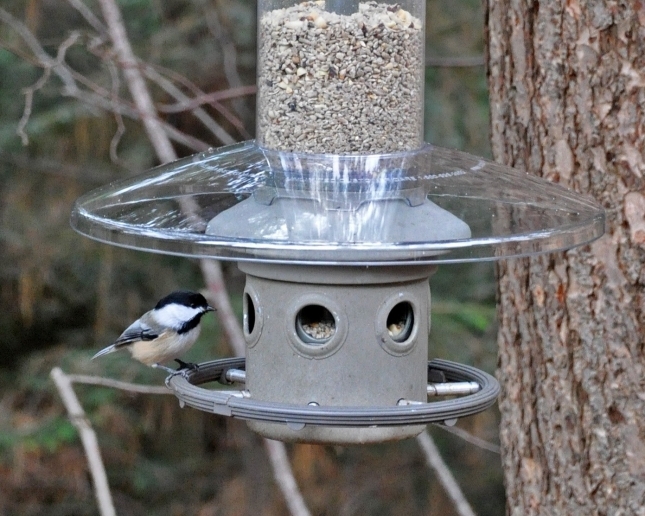 • Dome baffles to prevent access from above the feeders. • Catch Trays prevent seeds and hulls from falling to the ground. • Ground tray - not a good idea! • Seed Saucer: This large green tray for catching seed debris can be hung under a feeder. • Bird Seed Catcher: Placed on the ground below a feeder, it’s designed to catch sunflower seeds, millet and Nyjer® (thistle). • WBU BirdCare Brushes for cleaning feeders and bird baths. • Garden and vinyl gloves for use while cleaning feeders and bird baths. ASK US FOR ADVICE! We know how to solve these problems!